CRUST: Combine flour and salt in medium bowl. Cut in Country Crock® Baking Sticks-Unsalted with pastry blender or two knives until coarse crumbs form. Add 4 to 5 tablespoons ice water, 1 tablespoon at a time, until dough forms. Knead dough with floured hands and shape into two discs, one slightly larger than the other. Wrap in plastic wrap and refrigerate until chilled, about 30 minutes. Preheat oven to 425°. Preheat baking sheet. Unwrap larger disc of dough and roll on lightly floured surface from center to edges to form a 12-inch circle. Press into 9-inch pie plate; set aside. Unwrap remaining pie dough and roll on lightly floured surface to form a 10-inch circle; set aside. FILLING: Combine 3/4 cup granulated sugar, cornstarch and cinnamon in large bowl. Add blueberries, peaches and orange peel and toss to coat. 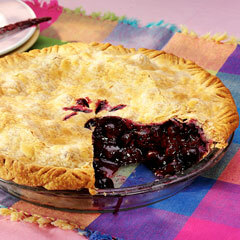 Arrange fruit mixture in pie crust. Top with remaining pie crust and seal edges. Cut several slits in top of crust with small sharp knife. Brush crust with milk and sprinkle with remaining 1 tablespoon granulated sugar.